I would go with The True Fox, but that backspace might be a problem for replacement caps, no? Unless you reuse a \| key there, but that's not really nice. My next choice is Aria. well, it's not that uncommon, many (serious) sets have the 1.5 backspace. Granite and Round 5 to name a couple. But yea Aria would be less problematic (you still need the smaller right shift). I think the GAP is an intended feature. Ya, the gap is going to be REALLY useful. My biggest problem with the 75% layout was not being able to find the arrow keys 100% of the time without having to look cause all the keys down there felt the same. I used an fc660c for a long time and really enjoyed the layout. One of my biggest complaint with that board was the lack of a dedicated `~ key (being a developer, I use that key often). This board solves that as well, so that is nice. Sounds really clever! True fox format it is for both boards! 2. Supporting a step key would still be nice in the future. 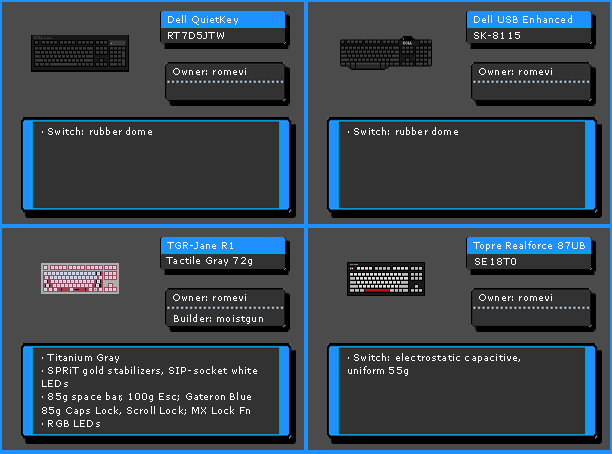 Some sets even include a step CTRL key, obviously for aesthetic reasons. But I think that is the main reason people like it anyways at this point. Definitely something I'd like to see in the future as well, but definitely not something that will make me hesitate about buying this at all either! You can "improve" something forever, but even as it is this is an extremely exciting keyboard. IF the buy is successful? hahaha. Absolutely no question that it will be. I do not need the gap either, I am actually using my arrows with space FN on ijkl; but for a dedicated arrow cluster it makes sense to separate it entirely from the rest of the keys; because, you have to "search for it" instead of just touch typing. Wow, a groupbuy for the whitefox, it's amazing to see the day that this finally all coming together and being made available. wish this wasn't happening through MassDrop, good luck with the GB Matt3o. 65% trully is the best layout. Hmm... it's probably too late for a suggestion like this to go out with the GB, but - any chance someone could product a companion sticker or thin "frame" that goes over the top and covers the screw holes? I really like having a clean top section without exposed screws. A thin plastic rectangular frame would work I think, or even just a vinyl sticker. I think there will probably be a large number of people who will proxy this through someone in the US. Like you, we get killed with customs and duty when going through 'official' vendors. Since the project is open source, the CAD files will be released so you'll be able to have a thin plastic/vinyl sheet cut from any lasercutting service. Last time Matt3o said a few hours it turned into a couple of days. does Matt3o run on valve time? Hi! My first post on GH hype hype! Can someone help me decide between the aria and the true? The true has the potential of having a limited edition, but I am more of a white keyboard kind of person as it is. The other thing is that my daily driver right now is a leopold fc660m and I am used to having larger sized, farther spaced back spaces, and am not sure what it will be like to have it closer. Other then that, I am thinking that I will be able to arrange the right column so that the delete goes into the corner on the right, and stuff like that, without too much issue? edit: spent a little bit more time thinking about it. I like that the back space is closer, it kind of makes sense. I don't use that backslash whatever key... ever... so maybe having the backspace closer would make it a bit more ergo in a way? The group buy has become incredibly complex and we are trying to avoid manufacturing and logistics errors. The GB is ready on MassDrop (but dormant) and soon a newsletter will be sent out with the official announcement. The group buy will officially start this Friday. the gold edition won't be released at this time. We will probably do it later this year (but don't hold your breath). I am thinking that I will be able to arrange the right column so that the delete goes into the corner on the right, and stuff like that, without too much issue? the key layout is completely up to you, you can customize any way you like it. to me, that is the only right place for the backspace, but it's down to personal preference at the end. Can you tell us if this will be on MD or separately? As I said the group buy will star this Friday on MassDrop. I don't know if I'll be able to grab some samples for myself and possibly sell them to MassDrop haters and I will actually know only when the drop is over, so don't rely on that. I'm really excited about how this is coming out, some things I would have definitely done differently, but like in every relationship you have to compromise a little. In this very moment I'm typing on a 100% working WhiteFox and it's amazing. I'm almost to tears, it took a year but it was totally worth it! Can you share pricing details yet? 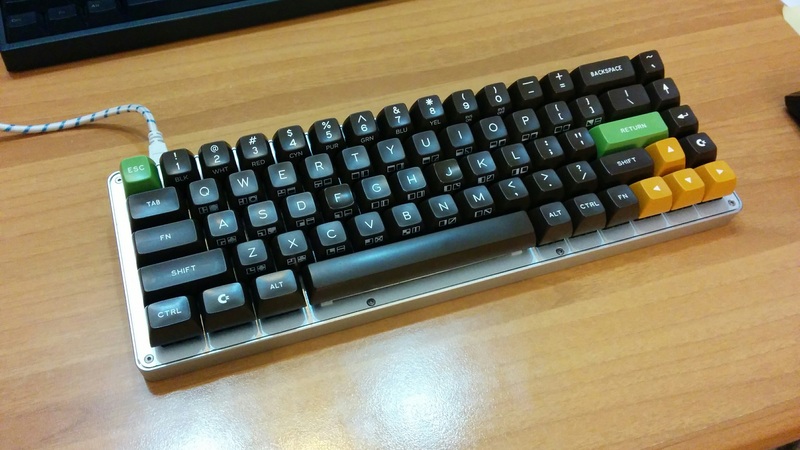 actually, let me ask you, how much would you expect from a high quality aluminum keyboard like this? I'm assuming that all the plate options will still be run? yes, all plates are a go. Given what I just paid for my WKL b.face build, somewhere around $250-$300? Hi Matteo, still learning how to reply to what you specifically responded to, but i think I have come to a bit of a conclusion. So, as far as the aria is concerned, if i end up preferring to have the back space 1 spot closer and lower, i could always remap it to that key and enjoy. if not, i could keep it in its original position. also, i think with this, keycap sets could be easier to find in the future? maybe? I think this probably makes the aria a better option for me. I doubt that i will need a dedicated tilde key and the backslash one anyways. next, I wanted to ask how the timeline is expected to look? i am sure it will be months before it is complete, but will it be closer to lets say 6 months till the keyboard is produced, or closer to a year? more? i understand if you cant comment! Obviously it depends on the number of cases that are manufactured, but given the design of the case, I'd expect the kit to be priced around 160€, 180€ tops (unassembled, with keycaps but no switches). Which does not mean that I consider it to be a cheap keyboard — on the contrary it looks like a lot of thought went into its design, so I assume that you made the right design choices to make it more affordable than the average custom keyboard with CNC case (no tight radius inside corners, etc.). Hence the limited number of options I guess, but I'd gladly take that over a nevending rollercoaster à la GH60. If I am not mistaken, the whole PCB is already soldered (micro USB, controllers, diodes), only the switches need to be soldered and for those who cannot there will be an option to have it fully assembled. Aria is definitely easier to handle and find keycaps for. If you are torn, Aria is a safer bet. You can still remap the backspace to the \| key if you want (but then you are left with a 2u key that does basically nothing). The group buy will last one week, production will be pretty fast actually, everything is pretty much set, so worst case scenario it should be a couple of months. yes, the kit comes with everything soldered apart from switches. If you want it assembled, you get the full keyboard ready to rock. I honestly don't have the final figures yet, we are still checking the last few things. Your estimate seems reasonable, though. Hopefully we can do a tad better than that, but again depends on quantity. Uhh, you do realize Matt3o is in Italy, Massdrop is in Jersey, and China is uhm somewhere in the middle? I mean you guys can just ask him to sign a letter for you or something and tape it underneath the housing. But will it add weight to the board? ****....like others I too have been following your development for a while. I was going to make my own 65% board but....UGH. That winkeyless layout would be my ideal layout like livingspeedbump said. Great job! 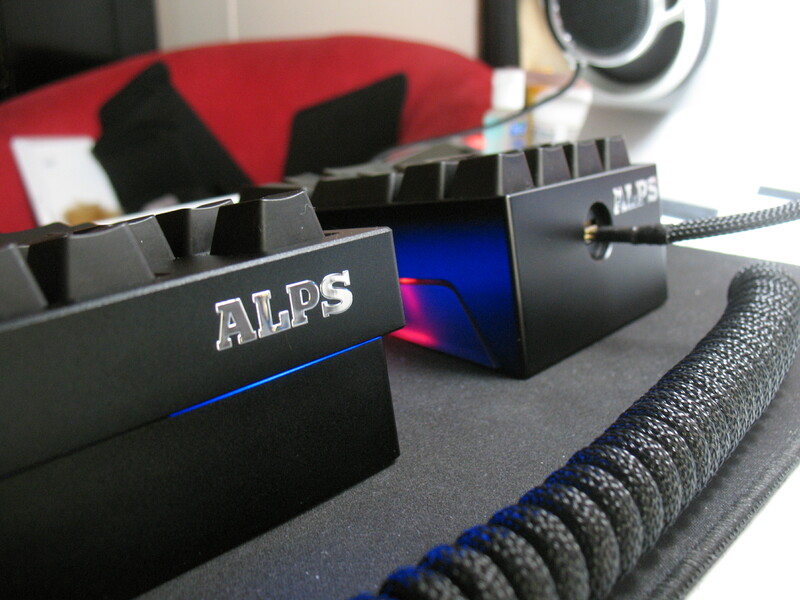 Push the boundaries and spread the Alps love! As long as you have the patience for it, it's definitely possible to modify an MX PCB for Alps compatibility. Maybe Matt3o will add it for a later revision. we are talking about the feasibility of this thing with MD, it won't be easy, though. The best thing is probably if I sign a card that will be bundled inside the box. Very excited Matt3o for this group buy and love The Real Fox layout. Page created in 0.117 seconds with 71 queries.